If you want to cook rice regularly for just 2-4 people at a time, it makes sense to buy a rice cooker for the job. However, getting a large one on the off chance that you may need to cook for several people for a party means that not only does it take up unnecessary counter space, but it also won’t be ideal for well made rice. Our best small rice cooker reviews will point you to some excellent and popular choices so you don’t feel like you’re giving up on nice features just because you want a small cooker. To see a larger range of small rice cookers, check out what’s available on Amazon. But first, let’s take a quick look at what features you should look for in a rice cooker of this size. Just like in bigger cookers, the inner cook pot can either be non-stick coated or not. While the former is easier to clean, you’ll have to be careful while using and cleaning it to ensure that the Teflon coating stays intact for health reasons. While many small cookers won’t have measurement lines on the inside of the cook pot, it is a convenient feature that eliminates the need to use a measuring cup for water. If you’re going to use the cooker on a regular basis, it’s worthwhile to invest in one that comes with a timer, a keep warm feature and a few auto-cook options so that you can cook more than just white rice in it. Keep in mind that brown rice takes longer to cook and with more water, so the capacity reduces. In this case, we suggest buying one that cooks brown rice really well. Let’s take a look at the very best small rice cookers available now. This cooker is one of the most advanced ones available in this size and is the top rated small electric rice cooker available right now. The Zojirushi NS-LAC05XT can handle up to 6 cups of cooked white rice, which is enough for about 4 people. Its fuzzy logic circuitry makes cooking all kinds of rice, polenta, quinoa, porridge, etc. a breeze because it adjusts cooking temperature and times as it happens and according to the cooking program you select. Other nice features are programmable delayed cooking, keep warm ability and a good non-stick inner cooking pot with measuring lines. Users love it so much that it made our list of best rice cookers overall, regardless of its small size. Read our detailed review of it there. This Tiger 3 cup Rice Cooker and Warmer switches automatically to Keep Warm after cooking is completed, making it worry-free and convenient. The Keep Warm function keeps rice warm for up to 12 hours so you could literally forget about it all day, without the rice turning hard or burnt on the bottom. The rice is cooked fairly quickly, within about 15 minutes. This model has been known to keep rice fluffy and soft throughout the day, so if you like to have rice for lunch and dinner in a single day, you can cook a double batch in one go in the morning and enjoy it again when you get back from work in the evening. There is no Auto Shut Off mode so if you don’t turn it off you will just end up keeping the rice warm until you notice it. It may be one of the higher priced cookers, but not as expensive as the Zojirushi above and it is also one of the most durable and can last for many years. It has a single non-stick inner pan that’s easy to use for serving and cleaning. The washable steam vent is also easy to clean since it’s removable. There is a spatula and rice measuring cup included. It also has a retractable power cord for easy storage and portability. Known as one of the top choices in rice cooker brands, the Aroma Simply Stainless 3-Cup (Uncooked) Rice Cooker is a favorite for many obvious reasons. To start out with, it’s made completely of high quality materials, even a surgical grade stainless steel inner pot, making it long lasting and durable. It is simple to use and inexpensive and takes the prize for best small rice cooker with stainless steel inner pot. It comes equipped with a ¾ standard size measuring cup to get that perfect amount of the rice and water combination. There is even an instruction booklet included for how to get the right grains-to-water ratio when using grains, white rice or brown rice. The inner pot markings of 1 to 3 cups make it easy to fill the water accurately. Just use the provided measuring cup for the rice and add water to the appropriate line. The capacity allows 3 cups of uncooked rice, which results in 6 cups of cooked. The texture comes out just right and even cooks brown rice well. This cooker is simple to use, with a one-touch operating system and a Keep Warm function that switches automatically. When rice is finished cooking, you will hear a popping sound as it switches from cooking to keeping warm. When rice is done, use the included serving spatula, made of bamboo, to fluff the rice and enjoy. While many users choose this unit mainly because its cooking pot is not Teflon-coated, this also means that it won’t be as easy to clean. However, users say that there’s very little rice sticking to the bottom at the end and a short soaking period before washing makes cleaning much easier. The first thing you will notice on the Tiger 3-Cup Micom Synchro Rice Cooker and Warmer is that the shape is quite different from the average rice cooker. It has a very modern, “squarish” look to it. Besides being attractive, there are other notable mentions. It has a signature Tacook plate, which uses a Synchro-Cooking function to prepare two dishes at the same time. It comes with an inner non-stick rice pot and a BPa-free steaming tray so you have the choice of steaming another dish while the rice is cooking. This model is definitely a lot pricier than the Tiger Micom above, but there’s plenty of reason for that. This rice cooker is unlike the others – it has a computerized cooking menu for many other types of cooking. There are eight options, including Quick Rice, Plain Rice, and Brown Rice. But that’s not all – how about Mixed Rice/Sweet Rice, Risotto, Synchro-Cooking, Stew/Soup, and Cake Baking. Don’t worry about all these extra options since an instruction manual is included. There’s also a cookbook included so you will know how to use this Synchro-Cooking function with no problem. This model has two preset cooking timers, optimized for the softest and fluffiest rice. The inner lid is detachable and washable and there is a rice measuring cup and non-stick spatula included. It would be nice if there was a retractable cord, but you can’t really complain when it comes with so much more. The first thing you notice about the Oster 3-Cup Rice Cooker is that it has a standard design but a sleek, black-colored look. The standard and basic design is not just for looks – it really is just a basic cooker that is easy to use. Since it is cheaper than most rice cookers, you would think it is unreliable but the build quality is actually quite nice and it cooks well too. The texture of the rice comes out to how Americans usually enjoy it, however, if you like the Asian style you can just add a little more water. This small non stick rice cooker holds 3 cups uncooked rice (6 cups cooked), with a removable pot for easy cleaning. What’s cool about this model is that it comes with a tempered glass lid, so you can look into it while the rice is cooking. After cooking, there’s an automatic Keep Warm function with indicator lights. Don’t forget the steaming basket, rice measuring cup, and a ladle as a bonus. If you like simplicity, this cooker is the way to go. This is another cooker that made our top rated list overall. The Panasonic SR-3NA Automatic maybe small but it’s the best simple cooker out there for 1 or 2 people. It can make 1.5 cups of uncooked rice but you should steer clear of trying brown rice in this. Here is our detailed review of this model. The Portable GABA (model AR 15) Mini Rice Cooker sure is small but it has a very cool black and white design on the front that makes it hard to believe it is a rice cooker. No need to store – this kitchen device would look very nice just sitting on a counter top. It is designed to be portable and has a built-in carry handle. It also has a power cord that is detachable. I would feel more comfortable having this unit out in the open since the outer part is cool to the touch. The non-stick inner pot is easy to take out and clean; it’s small enough to just throw in the dishwasher. It holds a smaller amount of 3 cups cooked rice (1 1/2 cups uncooked). Rice is cooked in about 20 minutes and has a good texture. For a smaller unit, this rice cooker is very durable and can last a long time. Smaller families would enjoy this model and it can go camping or to a pot luck with you too. This is also a cool looking kitchen gadget but with a few more advanced features included. 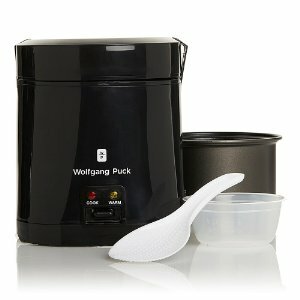 The Wolfgang Puck Portable Rice Cooker is available in white, black or red. It is best for sticky rice, although other types work just as well and you can even use this for a potluck stew or macaroni and cheese. It also cooks 1.5 cups of rice and shows you through indicator lights whether it is cooking or keeping it warm. The cooking pot is non-stick and easily fits in even the smallest dishwasher. It comes with a handle, a measuring cup, a scoop and detachable cord. this is a very good review. i like your site: concise, direct, good info. i particularly like your logo. and thanks for the tips on the portable choices. i have a couple of friends that this would make great holiday gifts.